Greetings again from the darkness. Freedom fighters or terrorists? Which label gets applied is often dependent upon one’s point of view. In 1976 an Air France flight from Tel Aviv to Paris via Athens was hijacked. Director Jose Padilha (“Narcos”, ROBOCOP, 2014) brings us the big screen version of Gregory Burke’s (’71) screenplay. 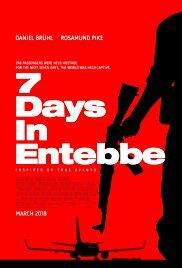 The 7 day ordeal bounces between the captors and hostages at the abandoned terminal in Uganda and the political maneuverings of the Israeli government officials as they deliberate whether to break with policy and negotiate with terrorists. There are also flashbacks to the planning stages with the hijackers, in an attempt to help us understand their perspective. Daniel Bruhl plays Wilifried Bose and Rosamund Pike plays Brigitte Kuhlmann. These are the two main hijackers who get most of our attention. Mr. Bruhl seems destined to always play the ultra-serious character, and Ms. Pike is once again miscast … something that happens whenever she is cast. Although she seems to throw down her best Patty Hearst look, we never really buy these two as committed to the cause, which prevents the necessary build-up of suspense. The film’s biggest flaw is not capitalizing on the opportunity afforded by Nonso Anozie’s Idi Amin Dada, and even more disappointing is the abbreviated scenes between Shimon Peres (Eddie Marsan) and Yizhak Rabin (Lior Ashkenazi, FOXTROT). The two actors excel in their head-to-head confrontations, but we feel cheated every time it cuts away. Once a strategy is formed, we are introduced to the Special Ops team (IDF). They only have a day or two to train and rehearse, and one of the key players is Ben Schnetzer (THE BOOK THIEF, 2013). He and his girlfriend quarrel over his duty, which keeps him away from her dancing performance with Batsheva Dance Company. As Operation Thunderbolt proceeds, the crosscuts between Special Ops training and the dance rehearsals are setting the stage for the film’s climax. So the hijackers never really generate the feeling of danger, the government deliberations are cut short, and the filmmaker takes a huge creative risk by synchronizing the final rescue mission with the opening night dance performance. The film is negatively impacted by poor pacing, an overall lack of tension for such a terrifying historical event, and questionable, albeit creative, story-telling structure. It does serve the purpose of educating those unfamiliar with the story, and it’s a reminder that even 4 decades later, the Israeli – Palestinian hostilities continue. As a special note of interest, the only Special Ops member killed in the raid was Yoni Netanyahu, the brother of the current Prime Minister of Israel. This entry was posted on Thursday, March 15th, 2018 at 6:20 pm and is filed under Drama, Thriller. You can follow any responses to this entry through the RSS 2.0 feed. You can leave a response, or trackback from your own site.